Intel's technology and manufacturing group leader, William Holt, says that if Intel wants to keep improving its chips, it will soon have to start using fundamentally new technologies. The company does not know which technology will be adopted, but there are two possible candidates at this stage - Spintronics, and tunneling transistors. William says that the new technologies will have to be commercialized in four to five years (when Intel moves over to 7-nm production, which is thought to be the limit of silicon transistors), and will initially be used alongside silicon transistors. Intel says we'll need to stop expecting chips to be faster - as the new technologies will mostly benefit the energy efficiency rather than the speed of Intel's future chips. 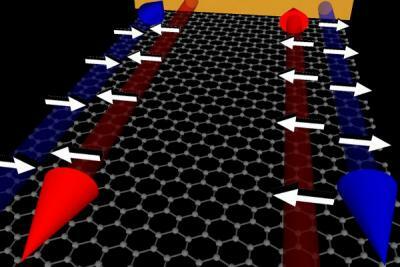 Researchers from MIT discovered that under a powerful magnetic field and at very low temperatures, graphene can filter electrons according to the direction of their spin. 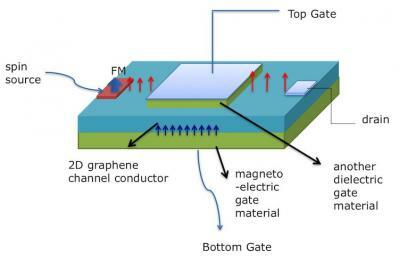 This is something that cannot be done by any conventional electronic system - and may make graphene very useful for quantum computing. it is known that when a magnetic field is turned on perpendicular to a graphene flake, current flows only along the edge, and in one direction (clockwise or counterclockwise, depending on the magnetic field orientation), while the bulk graphene sheet remains insulating. This is called the Quantum Hall effect. Researchers from the University of Cambridge in the UK have developed the world's first 3D microchip, based on Spintronics technology. The chip basically uses atoms to store and transfer the data - and not electronic transistors. This may lead to 3D MRAM chips that have a large memory density - thousands of times larger than what's available today. To create this chip they used sputtering - effectively making a sandwich on a silicon chip of cobalt, platinum and ruthenium atoms. The cobalt and platinum atoms store the digital information in a similar way to how a hard disk drive stores data. The ruthenium atoms act as messengers, communicating that information between neighboring layers of cobalt and platinum. Each of the layers is only a few atoms thick. Electron spin-splitting effect (Rashba effect) was demonstrated in a semiconductor (Bismuth selenide) that is far larger than has ever been seen before. This could lead the way towards room-temperature spintronic devices. The Rashba effect is the phenomenon of spin splitting with an applied electric field instead of a magnetic field. The Rashba effect is crucial for spintronic devices: for example when designing spin transistors, electrons of a single spin are injected and then – under an applied electric field – have their spins rotated. Rashba effect in well-established semiconductors (silicon or gallium arsenide for example) is very small - and so electrons have to travel large distances before any spin rotation is noticeable. This requires very pure materials and very low temperatures. Researchers from the University of Cincinnati has developed a novel way to control the spin of electrons using pure electric means. Before the researchers made their breakthrough, the only way to control the spin of electrons was by using local ferromagnets in device architectures. The scientists say that this technique results in design complexities when the demands for electronics require smaller and smaller transistors. The team used a device called a quantum point contact. Philippe Debray, research professor in the Department of Physics in the McMicken College of Arts & Sciences said "We used a quantum point contact — a short quantum wire — made from the semiconductor indium arsenide to generate strongly spin-polarized current by tuning the potential confinement of the wire by bias voltages of the gates that create it." He continued saying, "The key condition for the success of the experiment is that the potential confinement of the wire must be asymmetric — the transverse opposite edges of the quantum point contact must be asymmetrical. This was achieved by tuning the gate voltages. This asymmetry allows the electrons — thanks to relativistic effects — to interact with their surroundings via spin-orbit coupling and be polarized. The coupling triggers the spin polarization and the Coulomb electron–electron interaction enhances it." The team says that the next step in their research is to achieve the same results at higher temperatures using a different material like gallium arsenide. Researchers in the University of Washington say that they have been able to train tiny semiconductor crystals, called nanocrystals or quantum dots, to display new magnetic functions at room temperature using light as a trigger. "Single-atom effects have been observed before, but the yields are so low as to be impractical -- or the devices are randomly formed, with no control or predictability," Schenkel says. "Our approach to single-atom doping integrates ion beams with a modified scanning force microscope. We use the microscope's cantilever tip for both the nondestructive imaging of the target area and to position the ion beam." The device has the advantage of using virtually any species of atoms, says Schenkel. "We can start with any source of neutral atoms, such as phosphorus or antimony -- manganese is fashionable right now -- and choose one of a number of different sources to ionize them." The low-energy focused ion beam is sent through a hole in the microscope's cantilever. "The hole in the tip acts as a tiny aperture or mask," says Schenkel. "We've demonstrated holes with diameters as small as five nanometers" -- five billionths of a meter. To confirm that an ion has been implanted in the silicon, the region is fitted with electrodes to form a transistor channel, placed under a bias voltage. Then the implantation of a single ion -- even in a target area as large as two micrometers on a side (two millionths of a meter) -- can be detected as a change in the resistance of the channel current. Schenkel compares the current to electrons sliding down a hill; the presence of an implanted ion, he says, "is a bump in the way -- it impedes the electron flow." Says Schenkel, "The method is so sensitive that single-ion hits can be detected at room temperature in a device as large as four square microns. Inside that region we can form numerous single-atom devices, each with dimensions less than 100 nanometers." Before making a specific transistor or other device, single-ion implantation can be "practiced" with atoms of a noble gas that do not dope the substrate. "We wait until the transistor settles down, then switch to the species we want."